You’ll each want this gift when life inevitably gets rough during the course of your marriage. 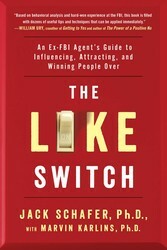 From The Like Switch: An Ex-FBI Agent’s Guide to Influencing, Attracting, and Winning People Over. I was once given a wonderful piece of advice that I pass on to young couples whenever I can: When relationships are still new, vibrant, and full of love, write letters to each other. Pour your hearts out and go into great detail about what you like and admire about the other person. But don’t share the letters. Instead, place them in separate sealed envelopes with your partner’s name on the front. Then place the letters in a box, which you’ll want to store in a safe place. In the event the relationship goes sour, you can give each other the letters and read them. This emotional reminder may be enough to recharge the feelings of love and jump-start a new era of togetherness. The letters can also be used as an emotional icebreaker to motivate you to resolve any major issues where you are at an impasse and need “something” to get you and your partner back on track toward solving your problem(s). One man I mentioned this idea to actually made a wooden container with a glass front similar to a fire alarm box found in many buildings. He then affixed a little metal hammer to the box with a metal chain. The sign on the box read, “In case of divorce, break glass.” The letters in the box served as a constant reminder to the couple of the reasons they liked and admired each other when they first fell in love. In the middle of a fight or escalating disagreement, either one of them could comment, “Is it time to break the glass?” This not-so-subtle reminder quickly deescalated the fight or disagreement and helped the couple resolve their conflict successfully. From a former FBI Special Agent specializing in behavior analysis and recruiting spies comes a handbook filled with his proven strategies on how to instantly read people and influence how they perceive you, so you can easily turn on the like switch. The Like Switch is packed with all the tools you need for turning strangers into friends, whether you are on a sales call, a first date, or a job interview. Dr. Jack Schafer is a former FBI Special Agent specializing in behavior analysis. In his new book The Like Switch he cracks the code on making great first impressions, building lasting relationships, and understanding others’ behavior to learn what they really think about you. With tips and techniques that hold the key to taking control of your communications, interactions, and relationships, The Like Switch shows you how to read others and get people to like you for a moment or a lifetime.